Ultimate Form is a Form in Kingdom Hearts III. It is triggered exclusively by Ultima Weapon's Formchange, it changes Sora's clothes to a design very similar to Final Form. It allows him to teleport around the battlefield and wield multiple swords in battle, overwhelming enemies with fast and powerful swipes that also possess great range. 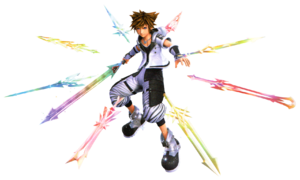 Ultimate Form turns Sora's coat, gloves, and shoes white, with a swirl pattern on his pants. Teleport Instantly close the distance between you and the target. Leaf Bracer Always finish casting recovery magic, even if you are hit by attacks in the process. Second Chance Always retain at least 1 HP if your are hit while you have 2 HP or more. Withstand Combo Always retain at least 1 HP if you are hit while you have 2 HP or more HP. You will remain protected throughout the enemy's combo. MP Hastera Recharge MP 20% faster when you run out. Stack the ability to increase the effect. Hidden Potential Gain additional Strength and Magic when battling powerful foes. Blade Barrier Press to guard against attacks from all directions. Ultimate Finish Unlock your Keyblade's full potential and perform a powerful move.